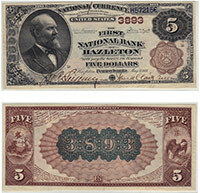 A total of nine national banks issued money like this. So far no survivors have been found. If you have one of these $50 bills then you definitely want to be the first to get it to market, as a financial reward awaits you. These are worth tens of thousands of dollars. The exact value is just based on the condition and bank of issue. Please contact us for details.